[Rajendra] got tired of building the same basic circuits time and again on the breadboard. He decided to build some simple, modular circuits on protoboard and make them easy to interface with the breadboard. As you can see, he ended up with seven modules that make prototyping faster and easier. At first glance some might not seem all that beneficial. For instance, making a board for an 18-pin PIC microcontroller into a single-in-line form factor would seem like you’re actually wasting breadboard space when compared to the DIL package of the chip. But consider that the oscillator and its capacitors, reset button, and programming header are also on the breakout board and will not have to be built in place. There are also several I/O boards, one with five buttons, another with an LED bar graph, and a set of LEDs with a SIL resistor package on-board. 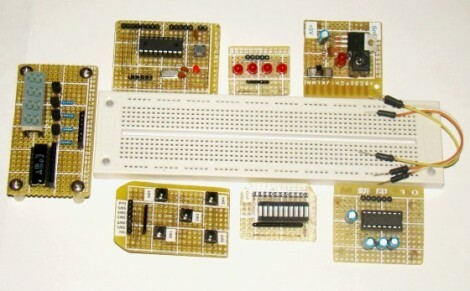 These modules can be plugged into a breadboard and wired up with jumper wires, or connected directly to the same rows as the microcontroller module. I’ve done the same thing, especially with a combination of LED projects and microcontrollers. I started with arduino but the lack of breadboarding was infuriating. This is a lot cleaner than any of the work I did though. Great work. I love seeing this though as it shows me what more I could do to speed up simple things. I actually have a couple of boards I double stacked though for more space savings. They’re essentially arduino shields that plug into a breadboard, right? No, they’re not. There’s a whole world of options out there besides Arduino. An Arduino is an AVR MCU along with the Arduino firmware. This contains neither. Seconded. I think my two are still in the loft at my parents. I’ve been considering doing something like this recently. Lining up the ICSP pins and so forth every time is a pain. 74HC595 modules might also be nice. I love the idea – and he’s done a nice job. The only thing I would change is the size. I see a lot of wasted space and breadboard real-estate there. These are a great idea, but I agree with George in the space wasted. I’m going to build a few of these but instead use 90* bent pins, that’d make the boards “stand” on the breadboard. That way the “bread-shields” wont take up on your breadboard space, and again, great idea. I think that you can really improve things if you get a development board with many of those things and then just add the custom part on the breadboard.